According to the Sleep Foundation, most adults need between 7-10 hours' sleep each night, although six hours in some people can be appropriate. But did you also know, how we sleep not only affects our cognitive function and behaviours, but unusual changes in sleep patterns may also be an early indicator of other conditions? In this two part series, Talking Aged Care looks at how our sleep patterns change as we age and the relation between sleep and cognitive abilities. Part two will examine how sleeping in the day affects us, how changing sleep patterns may help alleviate behaviour issues seen in come people with cognitive impairment, and some top tips to getting a good night’s sleep. When we sleep, we pass through five different stages: 1, 2, 3, 4 and REM (rapid eye movement). REM sleep is the time we most commonly have our vivid dreams, stages 1 and 2 are the lightest sleeps while 3 and 4 are when we’re in deep sleep. These stages progress cyclically from 1 to REM, with a complete sleep cycle taking between 90 to 110 minutes. Generally, as the night progresses, the time spent in deep stage 3 sleep decreases and the time spent in REM sleep increases. Clinical Neuropsychologist Professor Sharon Naismith says sleep starts changing at around 40 years and older. “It becomes more fragmented – we have less deep sleep and more awakenings in night,” she explains. Research has shown a bad night’s sleep does interfere with cognitive function, whatever the age; interestingly as a group 18 to 24 year-olds deprived of sleep suffer more from impaired performance than older adults. Two factors which occur when we sleep may contribute to this. A study in animals has shown during deep restorative sleep, the brain is ‘cleaned’ by spinal fluid. This washes out toxic proteins, including amyloid beta (Aβ); the build-up of this protein in the brain is associated with Alzheimer’s. In Stage 2 sleep, the brain will also experience a burst of neural activity known as sleep spindles. These have been associated with the integration of new memories and existing knowledge as well as directed remembering and forgetting. Prof Naismith notes around 60 percent of people with mild cognitive impairment report poor quality of sleep, and she says if an older person has sleep problems and mild cognitive impairment, generally the cognitive decline is much faster than someone who does not have sleep problems. “But it is still not known if the two are linked or just simply exist side by side,” she says. Edith Cowen University, WA researchers have shown difficulty getting to sleep may be associated with cognitive decline and dementia. 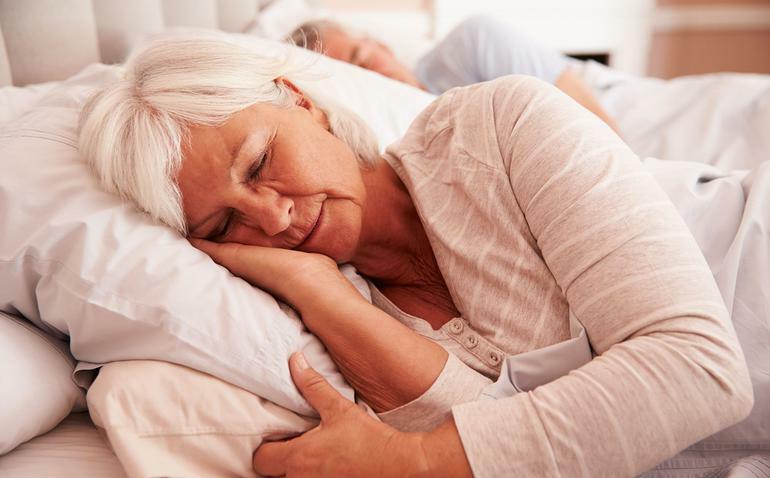 They examined the sleeping patterns of people aged over 60 and found those who reported difficulty getting to sleep had higher levels of Aβ in their brain. Researcher Dr Belinda Brown, says while previous studies had shown an association between sleep quality and the risk of Alzheimer’s disease, this was the first time that sleep latency, or the time it takes to get to sleep, had been directly linked with Aβ levels in the brain. Other sleeping conditions can also affect cognitive abilities. “Around 45 percent of samples of people living with obstructive sleep apnea (a condition which causes breathing to repeatedly stop and start during sleep) have mild cognitive impairment,” says Prof Naismith. Although this impairment could be caused by sleep fragmentation, she says further studies need to be done in this area as lack of oxygen to the brain in this condition may also be a factor. Noticeable changes in sleep patterns have also been associated with other conditions. Muscles usually enter a sleep atonia, a form of muscle paralysis in REM sleep. However studies have shown people who have gone on to develop Lewy body dementia, have experienced punching or kicking in REM sleep. “This sleep behaviour can precede diagnosis by 10 or 20 years,” claims Prof Naismith. One study found people diagnosed with REM Sleep Behaviour Disorder (RBD) also developed other degenerative brain diseases including Parkinson’s disease and multiple system atrophy. People in the study developed these conditions on average within 11 years of an RBD diagnosis. Changes to our circadian rhythm, (the 24 hour cycle that tells our bodies when to sleep and get up), may also occur as part of the ageing process. This shift is partly due to the level of the hormone melatonin which is produced by the pineal gland in the brain and helps to induce and regulate sleep; generally when it is dark, the body produces more melatonin and when it is light, production drops. Studies have shown melatonin secretion decreases in Alzheimer´s disease and Prof Naismith says people with mild cognitive impairment also have pronounced changes in their circadian rhythm. In part 2 of this series, we will look at the impact of long and short day time naps and make some suggestions for carers and care homes to potentially help reduce challenging behaviours.